Lily Banner has spent her entire life oblivious to the true secrets of the paranormal world around her. When her day job in the lab puts her in the middle of a supernatural war bubbling just beneath the surface, she finds herself in need of help—but the aid comes from a stranger with more secrets than she could possibly imagine. 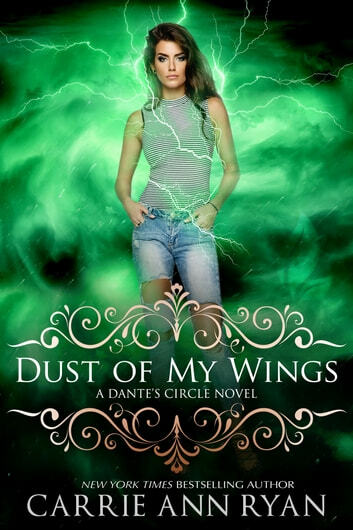 Angelic warrior Shade Griffin is charged with protecting the ancient secrets of the paranormals. But when he finds Lily, his world shifts, and his allegiance changes, forcing those who want Lily eliminated to take action. The war between the realms is on the edge of a blade, and only Shade and Lily can stop it. I think my favorite thing about Dust of My Wings and the lore behind Shade is what an angel is. They aren't creatures sent by god, they aren't inherently good - they are supernatural creatures that have a bit of a reputation. It was quite refreshing to see them this way, and I really loved their society and the descriptions of their home. Shade is in trouble, though. He's left some angel dust laying around and a human had her hands on it now. The council is breathing down his neck telling him to fix it - by whatever means necessary. And he really hopes it doesn't get that far, especially one he meets the little neat freak, Lily. Lily was amazing - I loved all her little habits. And - well, not to give too much away, but when her paranormal side comes out - it's perfect, 100% perfect! It was a brilliant touch that really went far with me. My biggest problem with the story was in the side details. Some of them just didn't quite get explained enough for me, or they just weren't flushed out to the point that they really made a lot of sense. There were a couple details that seemed a bit out of place - I'm hoping they come into play later. There was also a missing spark between Shade and Lily. For destined mates, they just didn't seem to click with me. I love how the series began. The way the characters interact with one another . I fell in love with her writing, because it's simple and the touch of reality and fantasy were perfectly combined. Dust of My Wings it kinda funny and sensual that makes you think twice about angels. And it's kinda ironic that they have this "dust" . I was like; "tinker bell is that you?". But over all, this is a good book to read if you haven't read Carrie Ann Ryan, this is a good book to start. I could not get over the fact this book was about an angel and after discovering that he had fallen in love with a human who turned out to be a brownie......just amazing and awe inspiring. So the premise wasn't anything new. I would have appreciated it if the author could have come up with a more tactful description of the origin of the angel race in her book without taking a dig at religion. Not cool.